در این مقاله منحنی‌های شکنندگی سازه‌های بتنی 3، 5 و 8 طبقه­ی ایران بررسی شده است. سازه‌هایی که در این مقاله مورد ارزیابی قرار گرفتند، دارای سیستم قاب خمشی بتنی با شکل پذیری متوسط می­باشند، که طبق آیین‌نامه 2800 (ویرایش سوم) طراحی شدند. این مدل ها به صورت 3 بعدی در نرم افزار OpenSEES تحت 20 رکورد دور از گسل آیین‌نامه FEMA P695 ، که هر یک از g1/0 تا g5/1 مقیاس گردیدند، تحلیل دینامیکی فزاینده شدند و منحنی‌های IDA برای سه تیپ سازه مورد مطالعه ترسیم گردید. سپس با استفاده از نرم افزار MATLAB و در نظر گرفتن توزیع احتمالاتی لوگ-نرمال احتمال شکست در هر سطح عملکرد محاسبه گردید. سرانجام منحنی‌های شکنندگی برای حداکثر تغییرمکان بین طبقه‌ای در سطوح مختلف PGA ترسیم شد. نتایج حاکی از آن است که در مقایسه رفتار سازه با ارتفاع­های متفاوت، می­توان گفت که با افزایش ارتفاع، سازه زودتر وارد ناحیۀ غیرخطی شده و ظرفیت سازه کاهش می­یابد. به طور کلی با افزایش ارتفاع سازه، آسیب­پذیری سازه‌ در چهار سطح خرابی مشخص شده (خرابی کم، متوسط، زیاد و کامل) افزایش می‌یابد ولی روند افزایش احتمال خرابی، کم و کم­تر می‌گردد. احتمال خرابی کامل ساختمان در زلزله طرح (زلزله سطح خطر 1) نزدیک به صفر و احتمال خرابی زیاد نیز ناچیز می باشد، که با هدف طراحی آیین نامه 2800 که حفظ ایمنی جانی افراد و به حداقل رساندن تلفات جانی است، مطابقت دارد. در واقع سازه پایداری خود را بعد از زلزله سطح خطر 1 حفظ می نماید. In this article, the fragility curves of RC structures with 3, 5 and 8 stories in Iran have been studied. The structures which have been estimated in this article have the system of RC Intermediate Moment Frame which is designed in accordance with Standard No. 2800 (Third Edition). These models in order to make a non-linear analysis in 3D form, they were modeled in OpenSEES software. The structure analysis was selected of the type of increasing dynamic analysis. In selecting the records of the earthquakes, it was tried that the characteristics of the selected records to be close to the conditions of the construction as much as possible. For this reason, the far-from the fault records of the FEMA P695 Code was used. The selected records were scaled from 0.1g to 1.5g with 0.1g steps and in each step, the structure was analyzed. The IDA curves were drawn for three types of structures under consideration up to structural complete damage. Then using MATLAB software and considering the lognormal probability distribution, the failure probability for each performance level was calculated and the fragility curves for Max Inter Story Drift in different levels of PGA were drawn. The results indicate that in comparing the structure behavior with different heights, it can be said that with the increase of height, the structure reaches to non-linear zone sooner and the structure capacity decreases. In general, with the structure height increase, the structure vulnerability in four specified levels of damage (slight, moderate, extensive and complete) increases but the trend of the increase of damage probability decreases. For the low rise RC structures (Intermediate moment-resisting frame) which have been built in accordance with the Standard No. 2800 (Third Edition), the Probability of extensive and complete damage in earthquakes with PGA’s less than 0.4g and 1.0g accordingly is almost insignificant. For the mid and high rise buildings, the probability of extensive and complete damages in earthquakes with PGA’s less than 0.3g and 0.7g is almost insignificant. Akkar, S.; Sucuoglu, H. and Yakut, A. (2005), “Displacement based fragility functions for low- and mid-rise ordinary concrete buildings", Earthquake Spectra, 21(4), pp. 901-927. Kennedy, R.P. ; Cornell, A.C.; Campbell, R.D. ; Kaplan, S. and Perla, H.F. (1980). “Probabilistic seismic safety study of an existing nuclear power plant", Nuclear Eng. & Design, 59(2). Kircher , C.A. and Martin W, " Development of fragility Curve for Estimating of Earthquake Damage Work Shopon Continuing Action to Reduce losses from Earthquake , Washington ,Dc : U.S.Geological Survey. (1993). Anagnos, T.; Rojahn, C. and Kiremidjian, A.S. “Building fragility relationships for California”, Proceedings of the Fifth U.S. National Conference on Earthquake Engineering, pp. 389-396 (1994). Anagnos , T.Rojahn , C.and Kiremidjiam, “ATC joint Study on Fragility Of Building",NCEER-95-0003, Applied Technology Council ,CA.(1995). Satoshi TANAKA, Hiroyuki KAMEDA, Nobuoto NOJIMA, Shunsuke OHNISHI, (2000). “Evalution of Seismic Fragility for Highway Transportation System”, publisher:12WCEE. Murao, O. and Yamazaki, F. “Development of fragility curves for buildings in Japan”, Confronting Urban Earthquakes: Report of Fundamental Research on theMitigation of Urban Disasters Caused by Near-Field Earthquakes, pp. 226-230 (2000). Smyth, A. “Probabilistic bene_t-cost analysis for earthquake damage mitigation: Evaluating measures for apartment houses in Turkey", Earthquake Spectra, 20(1), (February 2004). Aziminejad, A.S. and Moghadam,A. (June 2007). “Effects of strength distribution on fragility curves of asymmetric single story building”, Proceedings of the Ninth Canadian Conference on Earthquake Engineering Ottawa, Ontario, Canada. Mark Adom-Asamoah, (16 May, 2012), “Generation of analytical fragility curves for Ghanaian non-ductile reinforced concrete frame buildings”, International Journal of the Physical Sciences Vol. 7(19), pp. 2735-2744. Office of National Building Regulations. (2009). “Topic ninth national building regulations.” Design and implementation of concrete buildings, Tehran, Iran. Mazzoni, S; McKenna, F; Scott, M.H; Fenves, G.L; & Jeremic B; (2007). “OpenSEES Command Language Manual”. Elnashai, A.S., Pinho, R. and Antoniou (2000), “INDYAS – A Program for Inelastic Dynamic Analysis of Structures,” Research Report ESEE/00-2, Engineering Seismology and Earthquake Engineering Section, Imperial College, London. Mander J.B., Priestley M.J.N., Park R. (1988). “Theoretical Stress-Strain Model for Confined Concrete”. 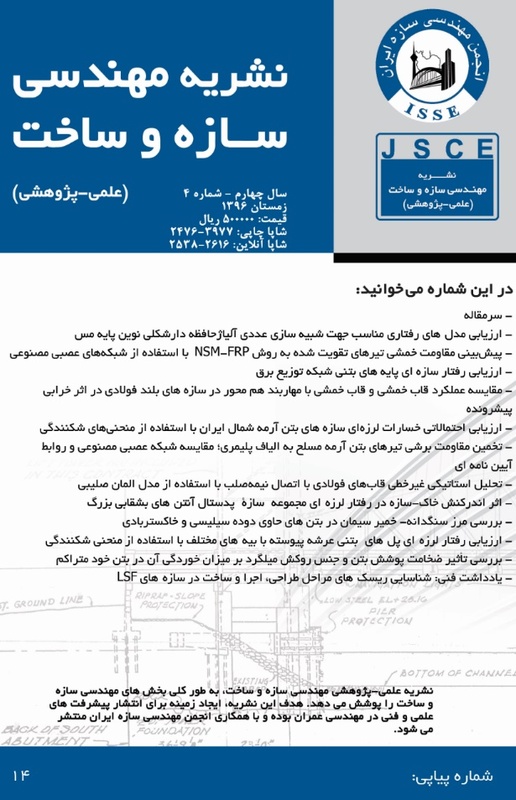 Journal of Structural Engineering, publisher: ASCE. Shome N, Cornell CA, (1999). Probability seismic demand analysis of nonlinear structures Ph.D, dissertation. Stanford University. FEMA. Quantification of building seismic performance factors. FEMA P695. (June 2009), Federal Emergency Management Agency, Washington, DC. Code No. 360, 2007, Islamic Republic of Iran, Management and Planning Organization, Instruction for Seismic Rehabilitation of Existing Buildings. Abdollahzadeh, G., & Shahaky, M. (2011). Probabilistic seismic hazard assessment of Babol, Iran. Iranian Journal of Energy & Environment, 2, 274-285. Pahlavan, H., Zakeri, B., Amiri, G. G., & Shaianfar, M. (2015). Probabilistic vulnerability assessment of horizontally curved multiframe RC box-girder highway bridges. Journal of Performance of Constructed Facilities, 30(3), 04015038.